Happy Halloween, friends! This is the first year I'm actually dressing up at work. The scarecrow costume I did on Saturday turned out so well that I decided to do it again today. I also bought a big bag of candy in hopes that kids in my apartment building go trick-or-treating inside the building, but that could be wishful thinking. This month I thought to myself, what if I stopped blogging? Obviously, though, I didn't stop. The whole process can be motivating and discouraging and rewarding all at once. It's a coin I'm willing to flip. I wrote about living in the suburbs and why I like it. For anyone considering the Bikini Body Guide fitness program, or just curious about what workout routine I follow, I talked about my experience with BBG, sharing my takeaways and pieces of advice. My weekly three things included running into an old friend for the first time in three years, a reminder that fitness journeys don't have a finish line, and a theory about compliments we receive. Both of the books I read this month had me emotional and rooting for the main character. 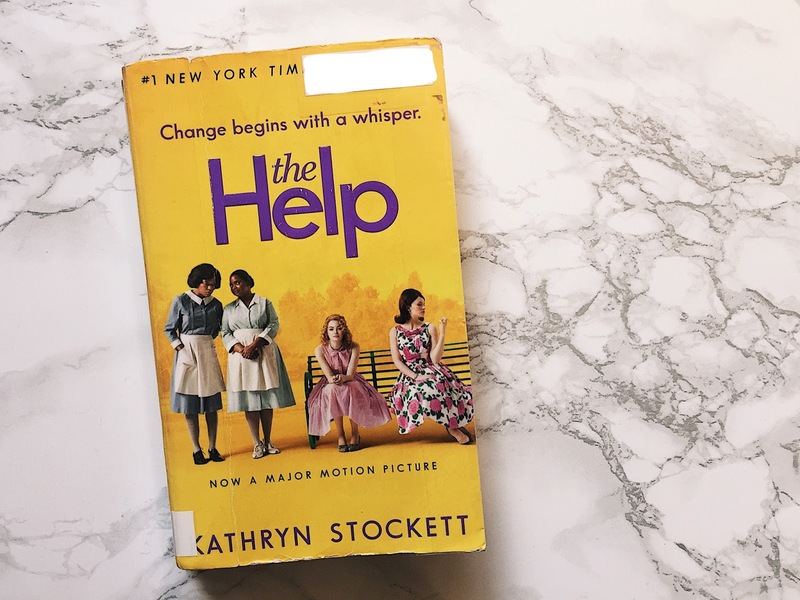 Plot: Set in Jackson, Mississippi in 1962, "The Help" is the story of rich white women and the black maids who raise their children. The lifestyle is accepted, never questioned. That is until Skeeter, a recent college graduate and aspiring writer, well, questions it. She wants to hear the perspective of the help and write a book about it. She meets with maids in secret, interviewing them and writing their stories. Though these black women have been with their white families for years, there's a lot they haven't said, until now. 1 | I am having the coziest weekend of reading and writing and, of course, watching "Stranger Things 2." Most of my time has been spent on the couch, and I'm very okay with that, even though my Apple Watch probably thinks I'm dead. I did get off the couch for a while last night to go to my friend's Halloween party, which was a lot of fun. I've gotten very good at coming up with costumes that require absolutely no purchases. I've been a member at my gym since I started college, working out regularly for the past six years or so. Generally, I work out about 5-6 days per week. The fact that I go to the gym is consistent, but what I do at the gym varies. Back in March of last year, I tried Kayla Itsines' Bikini Body Guide, a 12-week workout plan consisting of circuit workouts Monday/Wednesday/Friday and low-intensity steady cardio Tuesday/Thursday/Saturday. I went through the guide twice, then took a break for a while. Now, I'm working through it again. 1 | It's finally starting to look like fall around here. Usually by the time we get this far into October, all of the trees have changed colors. For whatever reason, most are still green, but we're starting to see some yellow and orange ones pop up, and I am loving it. I hate when I start writing about writing, or blogging about blogging, because I feel like it makes me look like a try-hard. It makes it seem like my thoughts aren't genuine even though they are. On my drive home from work yesterday, I was thinking about my blog. About how I haven't put up a post during the week in two weeks. How that's the first time that's happened since May. How I haven't been on Twitter much lately, so I haven't been promoting my blog over there as much, but does it even matter since I barely have any followers anyway? Do my "promotions" actually do anything? Surely there are bloggers out there who don't use Twitter but still have an audience. I wonder how long it took popular bloggers to attract a lot of readers. I wonder if they ever doubt themselves. How long can I blog without an increase in my readership before it's embarrassing? 1 | This is the first time in a long time that I haven't had a blog post go up during the week. I haven't had any ideas on what to post about. None. I'm a little disappointed in myself but now is when I'm glad I started this series. This is the time when it's really helpful. When I don't have any ideas on what to post about, at least I'm still getting something out there once a week. This is the first 3 Things post that I'm writing in advance and scheduling. It feels weird! Even though I jot myself notes throughout the week, I don't actually write out these posts until Sunday morning. I don't know why – scheduling posts feels better and productive. I guess for these, I just like doing it in the moment. Anyway, I'm away for the weekend with my family and our Sunday is starting bright and early, so I'm writing this Saturday night. I live in the suburbs of Chicago. I always have. I grew up in a suburban house, a 40-minute train ride away from the city. The college I went to was not only in the suburbs but was set apart a bit because it had its own airport. When I moved out and into a place of my own, my apartment was only a few towns over from my parents' house. Then I moved in with my boyfriend, to another nearby town. I've always lived in the suburbs, and some people don't get it.